Reactions to the first news of HTC venturing into action cameras may have ranged from a few raised eyebrows to "GoPro or go home" chants but the Re camera isn't one to get easily upset. Cool-looking and friendly, the little gadget is the exact opposite of the tough, heavy-duty look of one of the potential main rivals. It's a bold move anyway by a maker who isn't among the industry's standard-setters in terms of image quality. Worse yet, a company that has been struggling to cope with tough competition lately. Then again, HTC insists on doing things their own way and haven't given up trying to innovate despite a few attempts that backfired. But while we're paid to be skeptical, we must admit there's something about the Re that makes us curious. Of course, there is the simple, friendly looks and the funny shape, bordering on stupid. But that's until you've held one and you have fired a few shots with it. The peculiar curved tube ends on a f/2.8 aperture 146° wide-angle lens, with a Sony-made 16MP 1/2.3" CMOS sensor behind it. HTC has equipped the Re camera with a standard and wide angle option setting for images - both in the maximum 4:3 aspect ratio at 16MP. 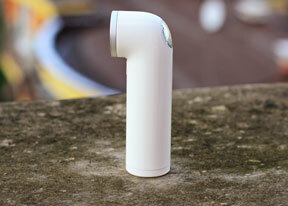 The Re camera can capture FullHD videos at 30fps as well as 720p at the same framerate. It can also do slo-mo 720p at 120fps. Here go the highlights. 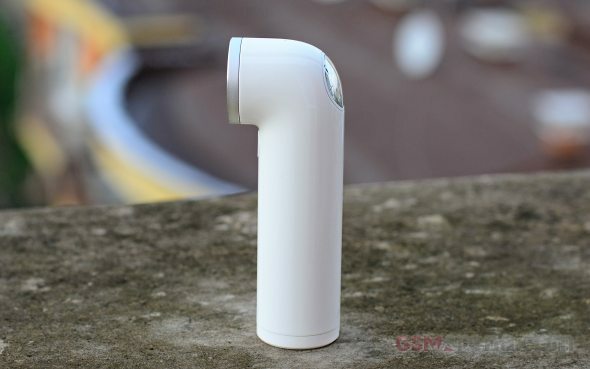 The periscope shape lets you hold the HTC Re and point like a gun when shooting handheld. And it's a perfect little thingy to use single-handedly. Just grab it and it'll turn on thanks to the grip and gyro sensors. Then press the key on the back - short press for photo, long press for video. That simple. HTC has gotten the still-imaging side of things just right. The Re boasts a higher resolution compared to most of its rivals - the top-of-the-range GoPro Hero4 offers 12MP. But the video capabilities aren't quite up to par - most sports and outdoors enthusiasts are looking for higher framerates than 30fps. A higher framerate option would've been more than welcome - 60fps at 1080p or at least 720p. A good action camera is supposed to capture all of the action, hard to do at only 30fps. There's no 4K video capture either. OK, extreme action may not be the HTC Re's element but it may just be a good enough wide-angle, water-proof extension of your smartphone. It's like you're given the option to leave your phone at home and only grab its camera. And it doesn't necessarily have to be an HTC phone either. The Re can be used with an iPhone or any Android running 4.3 or later.